Farro is considered the oldest variety of cultivated wheat. It was already consumed in the Neolithic and has been the basic food in Roman times. 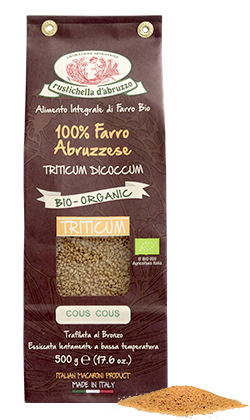 DICOCCUM is the most popular and cultivated type of farro, which can be found mainly in the areas of South-central Apennins and is present above all in organic agriculture. Furthermore, farro has a high rusticity and great environmental adaptability, which allows it not to be affected by wild herbs. For a very long time it has been forgotten, and now Rustichella d’Abruzzo has been milling it following the ancient tradition, through millstones, in order to preserve the germ, which is rich in nutrients. Farro has been rediscovered over the years thanks to its excellent organoleptic features and its low caloric intake and high digestibility. Rustichella d’Abruzzo Farro line debuted in 1991, when our product was awarded “Latest Product of the Year in Italy” and broke a record in sales in the US, after a New York Times article reported the peculiarities of farro. Spaghetti is perfect for lunches where taste and lightness blend in one moment. We recommend it with Rustichella organic “all’ Arrabbiata” sauce with a bit of Rustichella raw organic Extra Virgin Olive Oil for the lovers of chili pepper, or with Rustichella organic “Pomodoro e Basilico” sauce for the lovers of delicate tastes. Cooking time: 9-11 minutes. 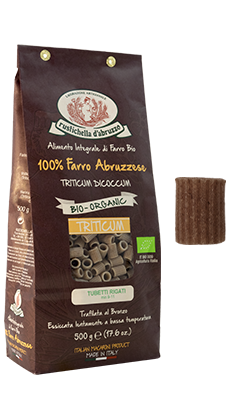 Rustichella d’Abruzzo 100% Abruzzo organic whole farro Tubetti is particularly suited for legume-based recipes, which are typical of the Abruzzo region. We recommend it with “Fagiolo Tondino del Tavo” out of the line PrimoGrano, crispy bacon and our organic Extra Virgin Olive Oil. Cooking time: 8-10 minutes. Pizzichi is a special shape similar to Maltagliati pasta, but with “curly” edges, and is produced only with 100% Abruzzo organic whole farro flours and through the traditional artisan production process. Pizzichi can be used in a number of recipes: you can use it with a soup of PrimoGrano “Fagiolo Tondino del Tavo” seasoned with INTOSSO Extra Virgin Olive Oil, or in the recipe called “Viva l’Italia” by Maria Stefania Peduzzi, owner of Rustichella d’Abruzzo, who prepares it in a “summer version” with Pachino cherry tomatoes, bufala mozzarella cheese, capers, PrimoGrano INTOSSO Extra Virgin Olive Oil and fresh basil. Cooking time: 10-12 minutes. This type of pasta is loved throughout all Italy and characterised by the typical shape of a “nib”. It is excellent for its versatility thanks to its design and the deep grooves on the surface that can collect better any kind of condiment. 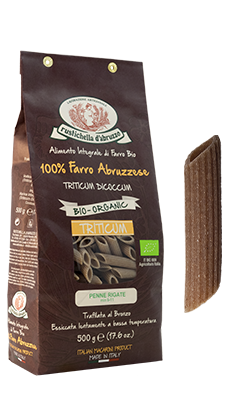 Made with 100% Abruzzo organic whole farro flour and through an artisan production process, Rustichella d’Abruzzo recommends to combine it with all the vegetable-based condiments, with a bit of our organic Extra Virgin Olive Oil, for people who love to take care of their wealth. Cooking time: 8-10 minutes. 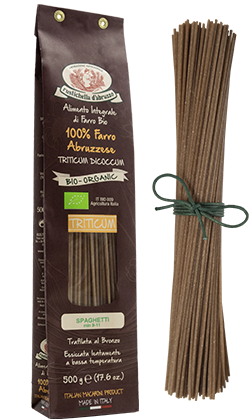 Particular type of pasta that looks like barley grains, it is made only with organic Dicoccum whole Farro of Abruzzo. Excellent for legume-based soups, vegetable soups or simply with broth. It is suited also for a cold pasta salad with cherry tomatoes, mozzarella cheese, basil and Rustichella d’Abruzzo organic Extra Virgin Olive Oil. Cooking time: 6-8 minutes. Couscous is an old multiethnic dish that has become over the years one of the most widespread dishes in the world, along with pasta and rice. Born as a local North-African dish, it then spread throughout Sicily and eventually in the whole world. There are plenty of recipes for the couscous: from the most traditional ones with seafood, meat, legumes or vegetables, to the sweet ones with milk, dates, dry fruits, honey and cinnamon. 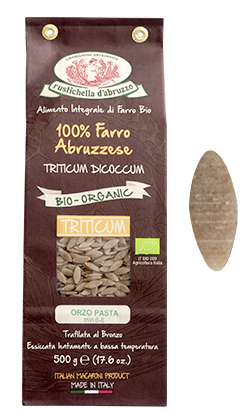 Rustichella d’Abruzzo proposes the version of 100% Abruzzo organic whole Dicoccum Farro.